Thank you Leanne for having me here today as a guest author on your blog. What’s a woman to do as she watches her world being ripped asunder? Amiria of Berwyck knows the price one must pay in order to ensure the safety of her clan. Torn between her father’s Scottish heritage and the memory of her English mother, she’ll do anything to guard her people. Pledging her oath of fealty to the very enemy who has laid siege to her home, she sets in motion a ruse that quickly begins to unravel. But how does she learn to forgive herself when her heart begins to soften in the ultimate sense of betrayal to those she has sworn to protect? Dristan of Blackmore, champion knight of King Henry II, has a reputation to uphold as the Devil’s Dragon. As his army invades the northern realm by conquering Berwyck Castle, he begins to manage the estate by first training its knights to properly defend its inhabitants and outlying villages. But not everything is as it appears or is it? Betrayed by those he had begun to trust, will he set aside his anger in order to let love into his heart? Together they are tied by an unspoken bond as they begin to rebuild the land and unite their people. But forces beyond their control attempt to destroy the fragile truce they have between them. Lies, treachery, and the deceit of others threaten to tear them apart but only love will forever bring them together. When I started writing this manuscript, I had no idea that I would continue the next four novels with secondary characters. I guess I just fell in love with them so much that I felt they deserved a story of their very own. I certainly didn’t expect the second novel, For All of Ever, to turn into a time travel. I’ve just finished the next round of edits on it and am looking forward to the day when I’ll have this two part book published. 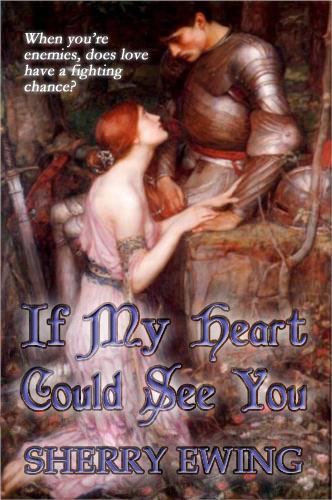 It’s my fondest hope that you’ll pick up a copy of If My Heart Could See You when it’s published in two weeks. I plan on having it available in print and also eBook format. You can find out more about me on my website at www.sherryewing.com. I am a huge fan of historical romance books. I cant wait to read this and Ms. Ewing’s future novels. Would love to add her books to my collection.